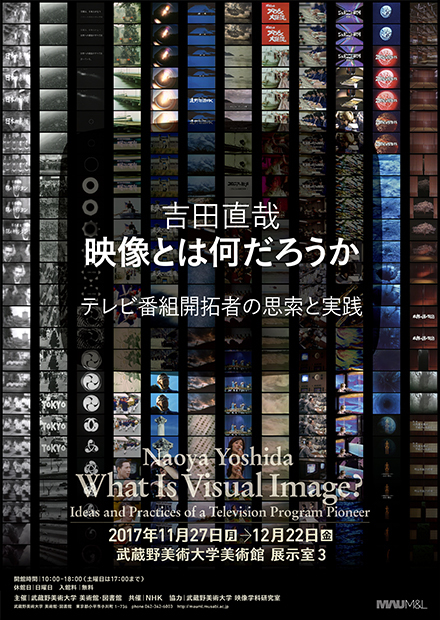 Naoya Yoshida : What Is Visual Image? Naoya Yoshida (1931-2008) created a host of television programs as a director at NHK. He also served as department head at the founding, in 1990, of our Department of Imaging Arts and Sciences. This exhibition explores his achievements and his view of visual image through examining, from the perspective of art and design, the television programs Yoshida created, his writings, and materials concerning his creative process, including the written treatments that were the basis for planning programs, organizational diagrams, and photographs.